Sushi is a traditional Japanese food and a favorite for many in the United States. Sashimi, which is thinly sliced raw fish often served with many sauces (like wasabi or soy sauce), is another popular delicacy. Unlike sashimi, sushi does not necessarily involve raw fish. In fact, sushi simply refers to the small balls or rolls of vinegar-flavored cold cooked rice. These rice rolls are then wrapped in seaweed and garnished with vegetables, egg, raw fish, cooked fish, or other foods. That said, when enjoying sashimi or sushi that contains raw fish, it's important to be aware of the health risks, like consuming a disease-causing bacteria or parasite. Human infection by Anisakiasis (herring worm) and other nematodes, or roundworms, can be caused by eating certain raw or undercooked fish. Ingestion of this tiny worm can result in severe abdominal pain, nausea, and vomiting within hours of eating. Even more, if the worms don’t get coughed up or vomited out, they can burrow into the walls of your intestines and cause a localized immune response. If this does occur, the worms eventually die and are removed by the immune system. However, in severe cases, physical removal of the worms by endoscopy or surgery is needed to reduce the pain. The bacterial species, Vibrio parahaemolyticus, has been associated with consumption of raw or undercooked fish and shellfish, particularly oysters. Infection by these bacteria can cause symptoms like diarrhea (even bloody), abdominal cramps, nausea, vomiting, headache, fever, and chills. The infection can become severe in people with weakened immune systems. Another Vibrio species, Vibrio vulnificus, has been found in oysters, clams, and crab. In healthy people, ingestion of this microbe may cause nausea, vomiting, watery diarrhea, abdominal cramps, and fever. But in people with liver disease or weakened immune systems, the microbe can enter the bloodstream, causing a life-threatening whole-body infection. In addition, the Vibrio species can cause wound infections through open sores exposed to water harboring the bacteria. Examples include scrapes when opening oysters or working on boats. Like the gastrointestinal illness, these types of wound infections are most severe in people with impaired immune systems. Listeriosis is an infection caused by the bacteria Listeria monocytogenes. This bacteria can be found in raw seafood, among other foods, like unpasteurized milk and dairy products, and vegetables, like raw sprouts. People most at risk for developing listeriosis are pregnant women and their newborns (the bacteria can pass through the placenta), people aged 65 or older, and those with weakened immune systems. In nonpregnant individuals, listeriosis may cause mild symptoms like fever and diarrhea, or more severe symptoms if the infection has spread to the nervous system (for example, stiff neck and confusion). In pregnant women, listeriosis may lead to a miscarriage, stillbirth, premature delivery, or a serious infection of the newborn. Salmonella infection causes symptoms of diarrhea, fever, and stomach cramps, often beginning within one to three days of eating the contaminated food. People most at risk of developing a more severe illness (sometimes requiring hospitalization), are people aged 65 and older, infants, and those with low immune function. 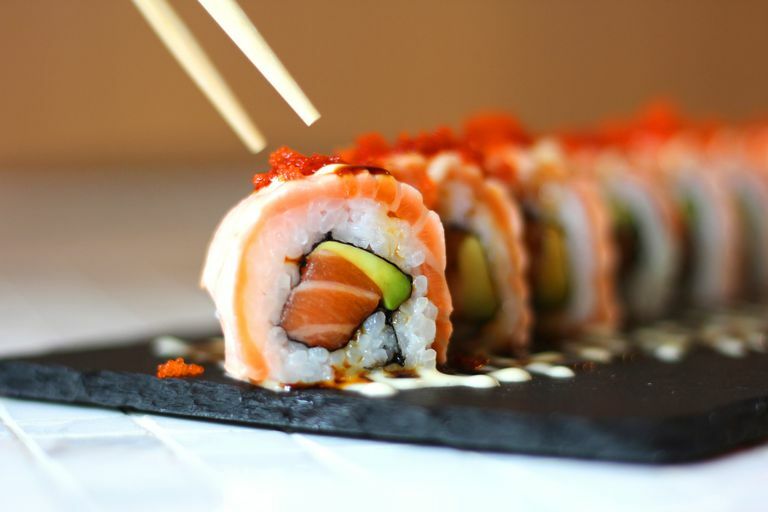 Bacillus Cereus is another food-borne illness associated with eating sushi, especially because it's linked to eating contaminated rice, along with other foods like fish, vegetables, meats, and milk. There are two types of Bacillus cereus infections, a diarrheal type, and a vomiting type. The vomiting type is linked to consuming contaminated rice products. If food handlers do not use good hand hygiene, other infections (like norovirus, hepatitis a, and Staphylococcus aureus) can spread if those who handle the food are sick and do not wash their hands properly (or stay home from work if ill). The bottom line here is that pregnant women, the elderly, small children or infants, people with liver disorders, and people with weakened immune systems have a greater risk for more severe outcomes from foodborne infections and should more carefully consider what they eat. That said, inquiring about the practices and guidelines used to prepare your food is never a bad idea—and if your gut instinct is that something is not right, follow it. Also, talk to your doctor if you are worried about your personal risks, or if you think you may have developed an infection from eating sushi or sashimi. Otherwise, if you are healthy and decide your food is coming from a reputable source, please do enjoy this Japanese, nutrient-rich delight. Centers for Disease Control and Prevention. (2012). Anisakiasis. Centers for Disease Control and Prevention. (2017). Questions and Answers: Listeria (Listeriosis). Centers for Disease Control and Prevention. (2017). Vibrio Species Causing Vibriosis. Information for Health Professionals & Laboratorians. Muscolino D, Giarratana F, Beninati C, Tornambene A, Panebianco A, Ziino G. Hygienic-sanitary evaluation of sushi and sashimi sold in Messina and Catania, Italy. Ital J Food Saf. 2014 Apr 17;3(2):1701. Can You Get Sick From Cow's Milk? What Can You Catch From a Kiss?